Thematic Research Program: Operator Algebras, Groups and Applications to Quantum Information"
* Fernando Lledó will be the program coordinator. "In his earliest work with operators [...], von Neumann recognized the need for a detailed study of families of operators. Many of the subtler properties of an operator are to be found only in the internal algebraic structure of the algebra of polynomials in the operator (and its closures relative to various operator topologies) or in the action of this algebra on the underlying Hilbert space. His interest in ergodic theory, group representations, and quantum mechanics contributed significantly to von Neumann’s realization that a theory of operator algebras was the next important stage in the development of this area of mathematics. The dictates of the subject itself had called for this development." Surprisingly, not only are these motivations fully verified, but they still provide inspiration for present day research in these areas. Meanwhile, the theory of quantum information started its development in the 90s, when it was realized that the particularities of quantum theory could be exploited to design revolutionary ways of information processing. This gave rise to the field of quantum information theory, which explores the advantages and limitations of information theoretical problems when encoded on quantum systems. Due to several reasons this field usually works under the hypothesis of finite dimensional systems, meaning that for a long time the theories of operator algebras and quantum information were developed almost independently. However, during the last decade operator spaces and operator systems have been proven to be very suitable to tackle different problems in quantum information and that has led to a re-connection between both fields. A consequence of this interaction has been the progress made in several important problems in both sides. On the one hand the use of operator algebras techniques in quantum information has been crucial to solve some open problems in the theory of Bell inequalities and nonlocal games and quantum channel theory. 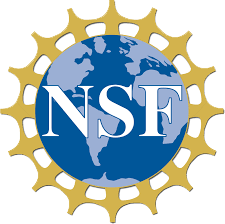 At the same time, the use of techniques from quantum information has been key to giving new and better proofs of noncommutative Grothendieck’s inequalites, to provide new embeddings between noncommutative Lp-spaces and to obtain new results around the Connes Embeding problem. 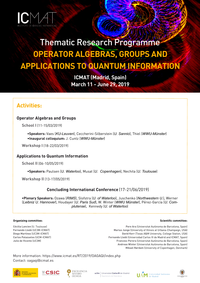 This Research Thematic Program's main goal is to further develop the study of operator algebras and their relation with quantum information. To do so, we plan to reunite both leading experts and Ph.D. students in mathematics and mathematical physicists with interests in seemingly disparate fields of Noncommutative Algebra, Dynamical Systems, Groups, Harmonic Analysis, Topology and Quantum Theory. This way, we intend to further stimulate the rich interplay between these areas of mathematics and the relatively young field of quantum information theory.